If you click on the shift the employee was due to work you should see a tick box that allows you to Mark as Sick. This will turn the shift into a Sick Leave entry. If you have multiple types of sick, you can choose which one to record it as in the drop down box. Alternatively, you can also delete the shift/move it to your gaps if the shift needs covering. 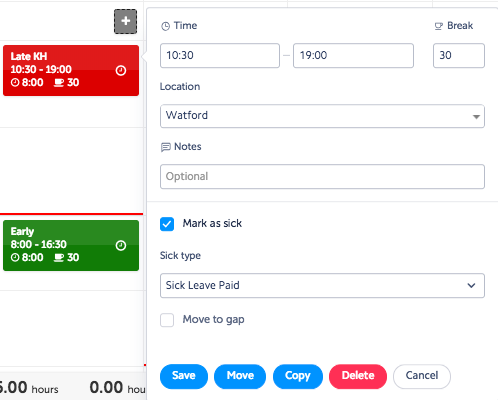 You'll then need to create a new Leave entry by clicking the + button and then Leave and selecting your Sick Leave option.